HOUSTON – Winners of 9 of its last 10 games, the Thunder is rolling, particularly on the offensive end where it has now scored at least 115 points in 15 consecutive games. That mark is tied for the most since 1982 when Doug Moe famously led the Denver Nuggets to a stretch of remarkably speedy and productive offensive seasons. On Saturday evening the Thunder will take on another highly productive offensive team in the Houston Rockets, albeit one who is generating those points in a slightly different way. Since January 1st, the Thunder ranks 8th in offensive rating with the Rockets at 4th, though the Thunder is fifth in pace during that stretch while Houston hangs in the middle of the pack at 17th. In order for the Thunder to defeat this Rockets club, to whom it lost on Christmas Day down in Houston, it will be imperative to keep the tempo high, like it has during this offensive explosion of late. All that work throughout the season and the missed shots that fell awry in the opening two months of the year have been paid back in full. In addition to being a clash between two top offenses, the Thunder and Rockets matchup will be a showdown between two Most Valuable Player candidates. The Thunder’s Paul George is averaging a career-best 28.0 points per game on 45.0 percent shooting, including 40.8 percent from the three-point line on a career-high 9.3 attempts. George is also snagging 7.9 rebounds to go with 4.0 assists and 2.3 steals per game, while showing out as a leading contender for Defensive Player of the Year. George and his fellow backcourt mate Ferguson will likely bear the heavy load of defending James Harden, who is averaging an outrageous 36.5 points per game this season on 44.4 percent shooting, including 37.5 percent from three-point range while making over 10 free throws per game. Remarkably, the last time Harden scored under 30 points was on Dec. 11. While George and James’ matchup is subtext, the real battle will be between the Thunder and Rockets as a whole. Whichever team executes better, whichever team’s role players knock down shots and whoever commits the fewest mistakes will come out on top. For the Thunder’s part, this team is confident and self-assured. While others made team-changing trades at Thursday’s deadline, the Thunder stood firm, and that delivered a message of faith and unity to the locker room. 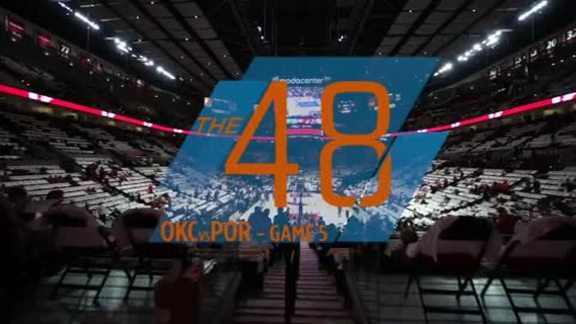 -	A critical component in this game will be the way the Thunder defends with physicality, but does it without fouling. Harden is known to be the best in the league at manipulating the game and drawing foul calls, so Thunder players will need to be body-to-body off of the ball, then to keep their hands to themselves when guarding on the ball to limit those easy opportunities for Houston both in the half court and in transition. “One on one defense, having help-side, having each other’s backs, protecting the three-point line. You know they like to get up a lot of threes,” said Ferguson. -	If the Thunder can get stops and finish out possessions with defensive boards (an area it struggled in the Christmas Day meeting in Houston), it will have a chance to get out and run against the Rockets. Across the board, the Thunder will also have a size advantage against Houston. Whether it’s sending the ball inside to Steven Adams on the block or playing above the rim, the Thunder will try to convert easy shots inside tonight. - There were many fun moments in the Thunder’s victory on Thursday over the Memphis Grizzlies, but none more thoughtful than when Steven Adams, standing on the bench, signaled for Ferguson to commit a foul with 1:34 remaining. 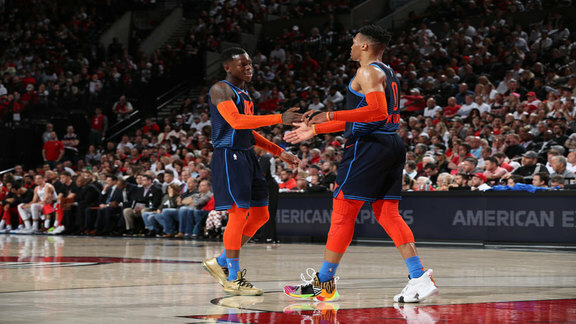 The outcome of the game was in hand, and Adams’ direction allowed for Thunder rotation players to get some extra rest, but also to allow rookie Hamidou Diallo and two-way forward Donte Grantham to get into the game. It was Grantham’s Thunder debut. - On the lighter side, the Thunder bench exploded when Dennis Schröder got out into the open floor on a breakaway and flushed home a one-handed dunk. There was a Memphis defender in the area who tried to contest it, but no matter. Schröder had made his first dunk of the year. After the game, he revealed that he still has some work to do to make good on a little friendly wager. “Me and Russ have a bet. I don’t know for how much, but I got to get to five (dunks). I don’t know if I’m going to do it. If he still passes me the ball in transition, then I might,” Schröder smirked. - An hour before game time, the NBA held its All-Star Draft, helmed by captains LeBron James and Giannis Antetokounmpo. After initially being selected to opposite teams, James and Antetokounmpo agreed to an unprecedented All-Star trade that sent Westbrook over to Antetokounmpo’s team to play alongside George. After the game, both were glad to have their buddy on the same side as them in Charlotte. “(Westbrook) is lucky he’s on my side,” George grinned.